Two posts today, so you may want to read the previous one first. Again, I am taking advantage of the wifi in our dinner restaurant. On Friday we began to use our 24-hour vaporetto pass. We took the No. 1, a slow boat that stops at every stop. We had both downloaded Rick Steve’s audio guide and listened as we went. It was good to hear more about what we were seeing. 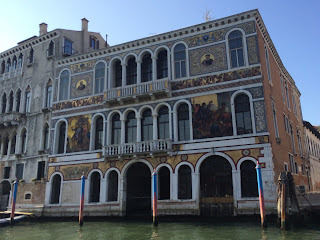 So many old buildings — palazzos, business buildings, homes, many now art galleries. The population here is dropping and the sea is rising. We got off at St. Mark’s Square and walked around. The audio tour continued here and was helpful. 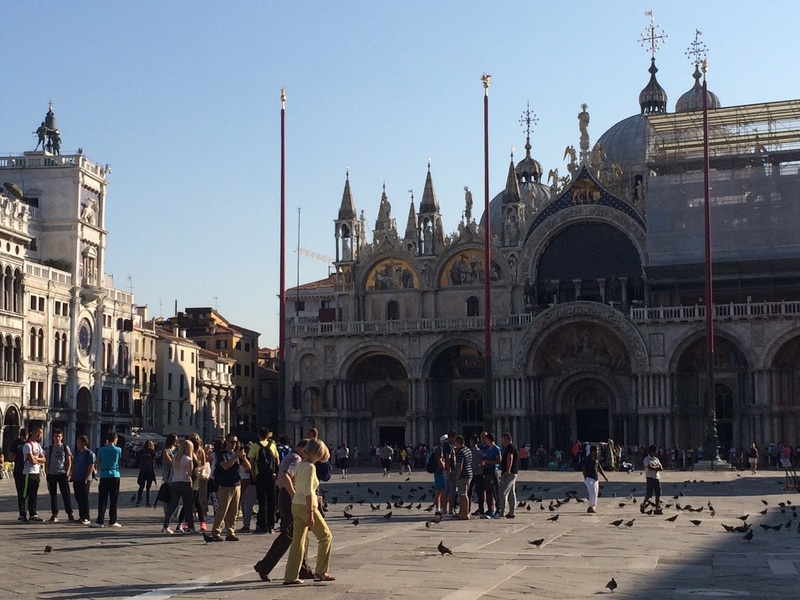 There are many wonderful churches and art museums in Venice, but we decided to give them a pass and just enjoy the city. 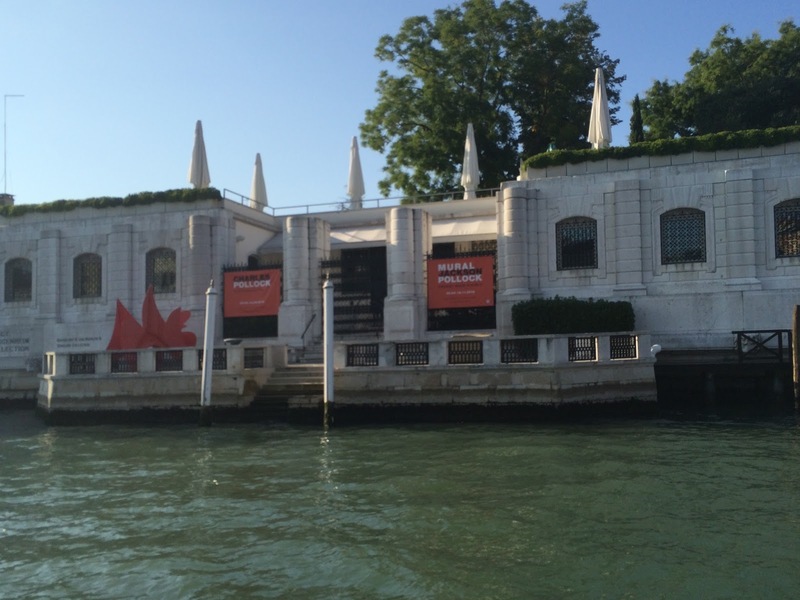 After taking time to look around well, we went back and got on a vaporetto back to our hotel area. 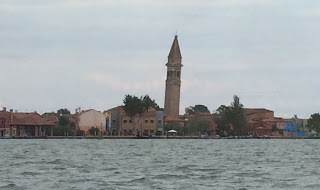 In the afternoon we had signed up for a tour to the islands of Murano and Burano, north of Venice in the large lagoon. We took the vaporetto the long way around, going south of the city instead of through the Grand Canal. 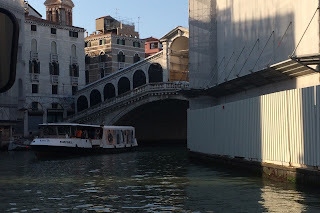 We passed under the bridge that brings vehicles onto the island, although they do not leave the large loading and parking area. There are no vehicles in Venice, not even bicycles. The crowds and the narrow streets make it impossible. It makes walking around much more pleasant, too. We passed the cruise port, where there were four or five large ships docked. From here, most cruises go into the eastern Mediterranean, where we were, and can include Dubrovnik, Croatia. Murano is the island that is famous for glassmaking. There are dozens of factories, but only four that are state-approved. We visited one of those and had a demonstration of both blown glass and formed glass. Then we went into the very large showroom — about a dozen rooms or more on two floors. There were no prices listed — you had to ask. But most were in the many thousands of euros. The least (note: edited from earlier post -- least not most most!!) expensive was €600. There were small items in the shop, beads for €10 and up. We enjoyed looking, but had no interest in buying. 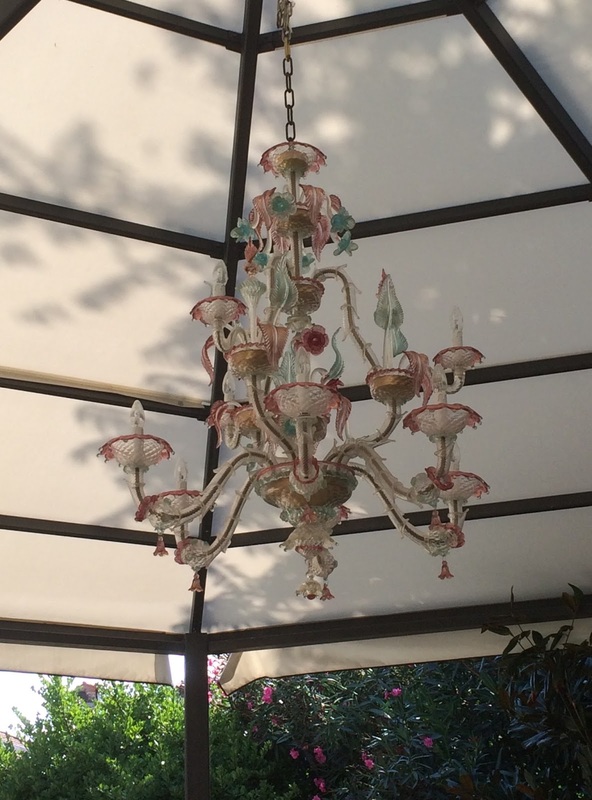 I had a nice chat from a woman from Hawaii who got a cut-glass crystal chandelier. Anything over €600 is packed and shipped home for free. No pictures were allowed inside, so all I have is one of the chandelier that was in the covered waiting area outside. 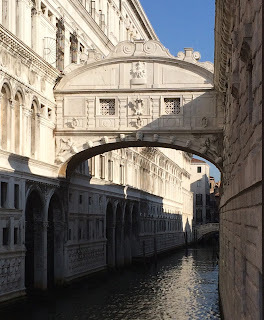 Much of what we saw was not particularly to our taste, but amazing and often beautiful. 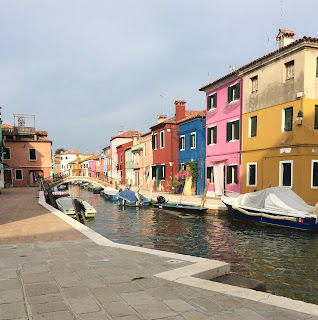 Burano is a much smaller island and is traditionally the home of handmade lace. That art will be ending soon, as the youngest woman making it is about 60-ish. The young women don’t want to do such tiny, painstaking work. We saw a demonstration and admired all the beautiful things in the shop. We also picked up a packet of a special cookie (biscuit) made there, S-shaped and lemon-flavored. A distinguishing characteristic of this island is the houses painted different colors. We were told that originally it was so the fishermen could find their way home at night. 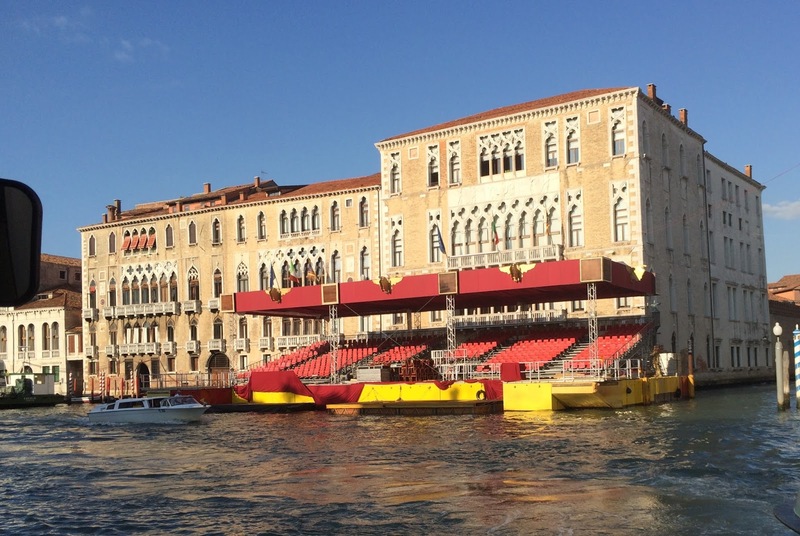 It was nice to wait for the boat in a park with trees — I find I am missing the green here in Venice, where it is very scarce. The boat ride was about a half hour, and we passed quite a few other islands. One very large one is where many of the vegetables and fruits are raised that are sold in Venice. It is especially famous for artichokes, and there is an annual festival. 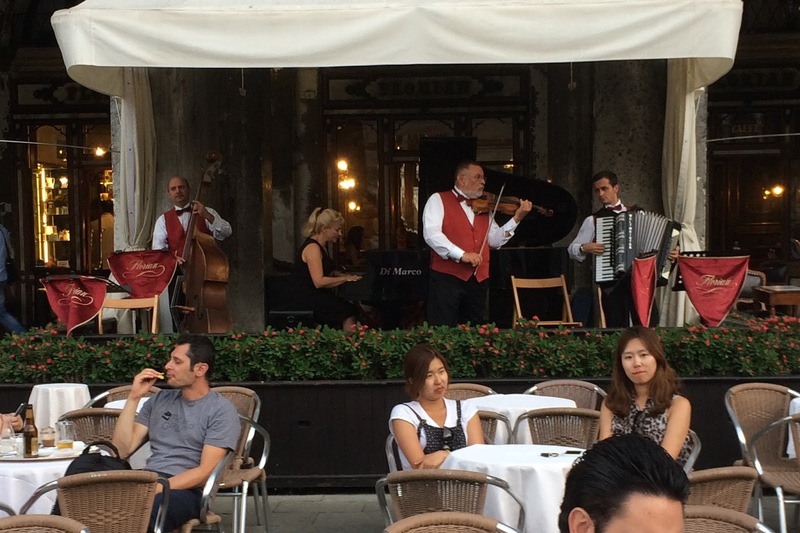 On the way back, we walked into San Marco Square again, this time to see the orchestras that play for the drinkers and diners at the cafes. There were three of them, and two were already playing. After catching a slow boat back, we had dinner just down the street. It finally rained (after threatening all day), but it was very light and we didn’t get wet walking back. Just a few words about Saturday. 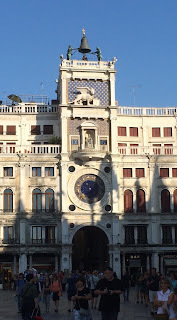 In the morning we took a walk through our area of the city — Canareggio. 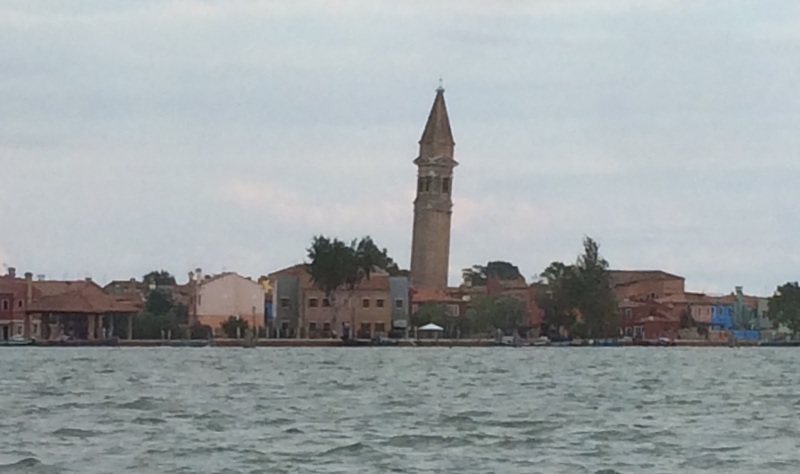 We headed north, crossed a lot of small canals, and got to the north side of the island; from there we could see over to the airport on the mainland as well as the smaller island that blocks Murano from view. It was so nice to walk without the crowds in the main parts of town. In fact, we saw very few people. It was obviously a residential area. We walked through a lovely small park — I find I really miss having greenery along the streets. There was a small rain shower. We went out about 5:00 to have a snack before dinner, as we’d had an early brunch. To our surprise, it was raining again (we *could* have looked out our windows…). We dodged the drops and went back to the Brek Cafeteria, where they have a drinks special with a small buffet of snacks. 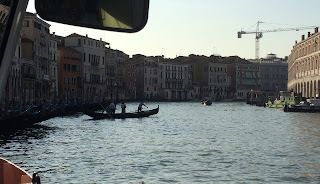 By the time we had finished, it was raining harder, so we hightailed it back to our hotel. Dinner later at a nearby restaurant. Stands for some event on the canal?